Photomediations: An Open Book, (http://www.photomediationsopenbook.net), produced by one of the pilots of the Europeana Space, has recently enjoyed an enthusiastic response from a variety of international audiences. Kamila Kuc gave a talk at the Archives of/For the Future NECS (European Network for Cinema and Media Studies) annual conference in Lodz, Poland (18-20 June 2015) titled ‘Photomediations: An Open Book: Writing and Curating Visual Arts Online'. The talk explored the nature of this innovative digital platform in relation to the traditional book as a paper object. Part of the ‘Post-Internet-Archives in Digital Aesthetics' panel, the presentation used Photomediations: An Open Book as a case study to argue for the need to experiment with new ways of displaying textual and visual content online by using resources under Creative Commons and other open licenses. Photomediations: An Open Book was also the key concern of Kuc's other talk, presented at the Transformative Practice and Theory: Where We Stand Today MeCCSA conference at Coventry University (2-3 July 2015). Part of the ‘Immersive, Mobile and Interactive Communications' panel, her paper, titled ‘Photomediations: An Open Book: The Book as Curated Object', concentrated on the wider debates about, and possibilities enabled by, open access and hybrid publishing. By looking at the book-as-a-curated-object, Kuc also explored new ways of curating online content in the digital age. She discussed issues of authorship, collaboration, interactivity and ethical responsibilities that are raised by the engagement with various forms of reading at a time when the book's modes of production, distribution, organisation and consumption are affected by the shift from analogue to digital and from codex to net. 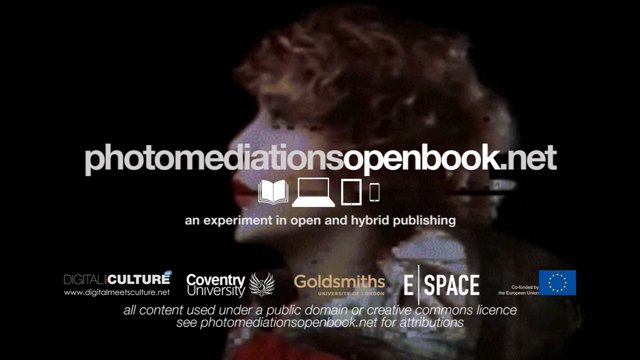 Last but not least, the pilot leader Joanna Zylinska gave a presentation about Photomediations: An Open Book at the Radical Open Access conference in Coventry (15-16 June 2015). The conference was designed as a space for critical discussion and debate in support of an ‘alternative' vision for open access and scholarly communication, beyond its dominant corporate and institutional models. Its aim was to explore some of the intellectually and politically exciting ways of understanding open access that are currently available internationally – predominantly in the arts, humanities and social sciences. Our Europeana pilot found itself in rather good company, which included the following international open access presses and initiatives: BABEL Working Group, Culture Machine, CLACSO, Journal of Radical Librarianship, Mattering Press, MayFly Books, Minor Compositions, MediaCommons Press, MLA Commons, Meson Press, Open Humanities Press, Open Knowledge Foundation, Punctum Books, Scalar, Spheres, tripleC and Vectors. The conference ended with a ‘call to arms': a proposal to start a horizontal collaborative consortium of radical open access initiatives worldwide. Under the umbrella of our sister project Photomediations Machine, we will be a founder member of this consortium.